Patric Hornqvist is back in the PPOTN spotlight. He started off this year’s edition courtesy of his three-goal, four-point performance in Pittsburgh’s 5-2 win over the New York Rangers in Game 1 of their Eastern Conference series, and returns after his OT winner against Washington on Wednesday night. The Swede continued his impressive postseason play by notching the winner as the Penguins took a 3-1 series lead over the Capitals in their East semifinal series. STAT PACK: Hornqvist had one goal and one assist, took three shots, blocked one, recorded six hits, and took 23 shifts in 16:14 of ice time. 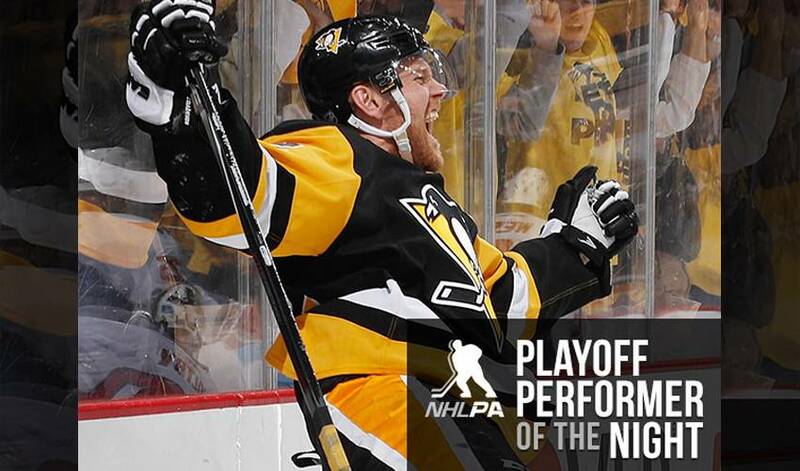 MILESTONE MOMENT: Hornqvist scored his first career postseason overtime and game-winning goal. He has registered one overtime goal in 509 career regular-season games (March 7, 2015 at Los Angeles Kings). HATS OFF TO PATRIC: His trio of tallies against the Blueshirts was the first career playoff hat trick for the native of Sollentuna, Sweden, who was traded to Pittsburgh in June of 2014. IT’S A FIRST! : With his Game 1 hat trick against the Rangers, Hornqvist became the first player in franchise history to register three goals in the team’s playoff opener. THREE CHEERS: Hornqvist collected his first regular season hat trick on February 29, 2016, a 6-0 win over Arizona that also saw him chip in with an assist. BIRTHDAY GIFT: How did Hornqvist celebrate his 25th birthday on New Year’s Day? He recorded two assists in a Nashville win over Calgary. “I guess it should be my birthday every day, right?” offered the forward, who was Swedish hockey’s Rookie of the Year in 2007 after his standout second season with Djurgården's regular team, scoring 23 goals and notching 34 points. ‘HORN’ OF PLENTY: Drafted 230th overall in 2005, Hornqvist has six 20-goal seasons to his name, and 153 total tallies since first joining the NHL ranks in 2008-09. WHO’S NO. 1? : Pittsburgh teammate Sidney Crosby was the first overall pick in that 2005 Draft. HONOURABLE MENTIONS: Matt Cullen scored his third goal of the playoffs for the Pens. Brian Dumoulin chipped in with two assists. Tom Kuhnhackl registered six hits. Trevor Daley was a plus-3.